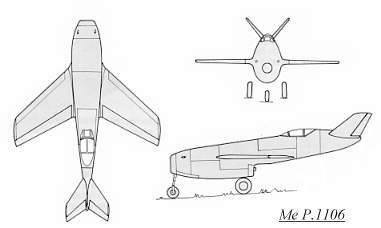 This Messerschmitt project was intended as an improvement to the Me P.1101. The P.1106 was redesigned many times (see below). The first version had a T-tail and the cockpit was faired into the vertical stabilizer. Later, this was changed to a V-tail and the cockpit was moved slightly forward. A He S 011 jet engine was planned for the power plant. The wings were swept back 40 degrees. Planned armament was two MK 108 30mm cannon. Since the pilot had poor visibility and the performance of the Me P.1101 was not improved upon, the project was abandoned.